A talented artist and antiquary, born in Dublin, Margaret McNair Stokes lived in the city most of her life. The family had a large Georgian house at 5 Merrion Square, and Margaret was educated at home. She studied art and antiquities under the influence of her father, William Stokes, MD, MRIA (1804-78), and his friends. She maintained close contact throughout her life with her older brother, Whitley Stokes, MRIA (1830-1909), a Celtic scholar and legal administrator. The family had a longstanding association with the Royal Irish Academy, and the scholarly circle in which Margaret worked in her early career included George Petrie, MRIA, Samuel Ferguson, MRIA, J. H. Todd, MRIA, and Edwin Wyndham Quin, earl of Dunraven, MRIA. She edited and illustrated some of their publications on Irish antiquities, architecture and manuscript heritage. Among her best known artistic achievements are the illustrations she provided for Samuel Ferguson’s The Cromlech on Howth: a poem (London, 1861). The book includes her intricate reworking of images from the Book of Kells, along with watercolours depicting scenes from Howth and Clontarf on the north Dublin coast. Margaret Stokes’ artistic talent emerged clearly in her illustrations for Samuel Ferguson’s Cromlech of Howth (London, 1861). The Cromlech on Howth: a poem / by Samuel Ferguson (London, 1861), plate 4. By the time she came to publish her research under her own name, Margaret was an informed and experienced editor, photographer, and illustrator. 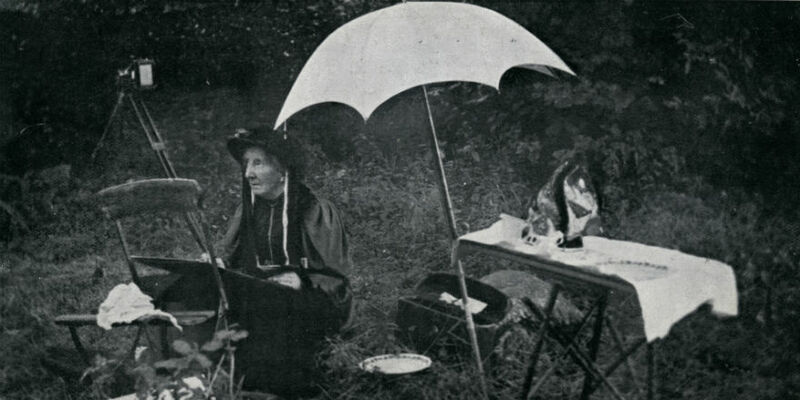 Two books based on her research, Early Christian architecture in Ireland (1878) and Early Christian art in Ireland (1887), include many of her accomplished drawings. Her Early Christian art was regularly reprinted well into the twentieth century and helped mould artistic perceptions of Irish heritage in the newly independent Ireland. Her High crosses of Castledermot and Durrow (1898) combines photography and original artwork in her pursuit of visual accuracy. Margaret Stokes had a very clear view of how her illustrations of high crosses were to be presented, using her technique of photography and art combined. Then, as now, producing high-quality images of such monuments in the landscape required skill and patience. In her communications with the RIA publications committee, she insisted that the illustrations of medieval high crosses she had personally prepared were integral to her work and could not be replaced by alternative photographs of the same objects. Constantly interested in new experiences, she wrote two books drawing on her continental travels late in her life: Six months on the Apennines (1892), and Three months in the forests of France (1895). In pursuing research on European architecture and sculpture at the sites of early Irish monasteries, she explained that she was attempting ‘to discover the reason for the development of certain styles in Ireland’. Rather than tracing the stories of medieval Irish monks, she was interested in the art and architecture they would have seen, believing them to have been important channels of influence between Ireland and Europe. Her interest in such associations extended to the folk customs of her own day, as in her visual analogies of funeral customs in both countries. She was also active in the Royal Society of Antiquaries of Ireland and in the County Kildare Archaeological Society. Her Academy obituary (Royal Irish Academy, Minutes of proceedings, 1901) noted ‘it will be hard to find again the same passionate devotion to the object of her study, and the same artistic excellence in the elaboration of her work’. Elizabeth Boyle, ‘Margaret Stokes (1832-1900) and the study of medieval Irish art in the nineteenth century’, in Ciara Breathnach, and Catherine Lawless (eds), Visual, material and print culture in nineteenth-century Ireland (Dublin: Four Courts, 2010), 73-84.